Suburbia at dusk. A nice neighborhood, if property values determine such a thing. It’s quiet. A little too quiet, to be cute about it. Someone walks alone through this residential idyll. But are they really alone? The voyeuristic slink of the camerawork suggests otherwise, and sure enough, it’s not long before an ominous vehicle appears in the background, creeping down the block, a silent stalker on four wheels. Even without an eerie synth soundtrack to hammer the reference home, it’s clear we’ve stumbled into John Carpenter’s neck of the genre woods. Except that aforementioned someone isn’t Jamie Lee Curtis or any of her lily-white friends, but Lakeith Stanfield, one of the young black stars of TV’s Atlanta. And it’s not Michael Myers behind the wheel this time, but a more communal evil—the kind that prowls affluent streets, watching for anyone that fits a certain description, anyone that “doesn’t belong.” We’re meant to think of Halloween. Of Trayvon Martin, too. These kind of dual associations are all over Get Out, the wildly entertaining directorial debut of sketch-comedy chameleon Jordan Peele. For every moment that sparks the recall function of horror buffs, there’s another that may provoke, for some portion of the audience, a much less pleasant twinge of recognition. The cold open described above could have come straight from the comedian’s brilliant, defunct variety show, Key & Peele—especially one of its Halloween episodes, which put culturally pointed spins on scary-movie tropes. Here, though, a punchline never arrives. And that’s because Peele, who also wrote the screenplay, has made a bona fide fright flick with dashes of cringe comedy, not the other way around. Maybe he got tired of laughing at the living, breathing reality of racism in America. Screaming is a good reaction, too. That’s not to say that Get Out is devoid of humor. Coming as it does from an expert parodist, the film is often funnier around its edges than most full-blown comedies are at center, even as Peele largely resists playing his scenario—a kind of town-with-a-secret spin on Guess Who’s Coming To Dinner—strictly for laughs. After that disquieting prologue, Get Out switches focus to photographer Chris (Daniel Kaluuya, from Sicario and the terrific exercise-bike episode of Black Mirror) as he prepares to accompany his girlfriend on a weekend trip to her hometown. Rose (Allison Williams) insists that her parents will have no problem with him being black. But once the two arrive at the massive suburban estate of Missy (Catherine Keener) and Dean (Bradley Whitford), Chris is put through the casually racist wringer. On top of the insensitive questions and embarrassing attempts at small talk (“I would have voted for Obama for a third term,” Dean proudly declares, minutes after introducing himself), there’s just something vaguely… off about the whole place. Could it have something to do with the family’s black maid and gardener, both of whom exhibit personalities that oscillate from robotically ingratiating to unnervingly unhinged? Or maybe the way Missy, constantly stirring her tea, keeps trying to get Chris to agree to hypnosis to cure him of his smoking habit? There’s a nefarious conspiracy here for audiences to unpack, and it’s all part of the way Peele uses a genre framework to explore how racism survives and mutates in an All Lives Matter culture, taking different insidious shapes. Early into the film’s terrific first hour, Chris and Rose run afoul a bullying bigot of a state trooper—an offhand encounter that drips with the implicit (and sadly headline-topical) threat of police brutality. But Get Out also gets into more submerged forms of prejudice in the charged interactions between Chris and Rose’s family. Whitford, even more perfectly cast here than he was as a white-collar cog of The Cabin In The Woods, performs a tireless display of paternalistic smarminess, managing to slip a couple subtle variations on “boy” into a single two-minute stretch. The social discomfort feeds directly into the suspense: Chris, valiantly struggling to keep his cool, can’t be sure if the unease he feels about the whole situation stems from a genuine danger or just a growing impatience with these condescending assholes. 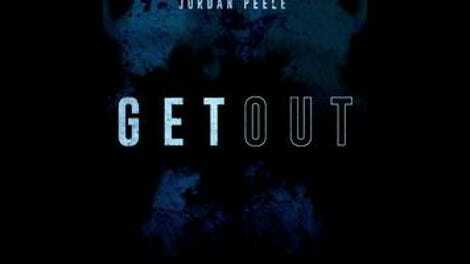 Get Out turns out to be more fun, and more provocative, than it is scary, at least in the traditional midnight-movie sense: The film works so well as a gauntlet of social horror that Peele almost didn’t need the more traditional thriller elements he introduces in the third act, when a carefully calibrated build in just-because-you’re-paranoid dread gives way to some disappointingly conventional survival games. (Here, the involvement of the prolific exploitation purveyors at Blumhouse Productions is most strongly felt.) There’s also a fairly needless subplot involving a TSA agent, played by LilRel Howery, who dual-functions as an exposition delivery system and a tension-breaking comic-relief sidekick; it’s the only part of the movie that betrays Peele’s sketch-comedy roots, plainly visible in his script for last year’s Keanu. On the other hand, the very nature of the film’s hero-villain dichotomy lends its climax a rare cathartic chill. Continuing a lineage of progressive horror that extends from Night Of The Living Dead to Bill Gunn’s Ganja & Hess to Attack The Block, Peele doesn’t just subvert a genre often dinged for making people of color expendable cleaver-fodder. He also flips pearl-clutching, white-flight anxiety about predatory black men on its ear, turning a gated community into the real danger zone. 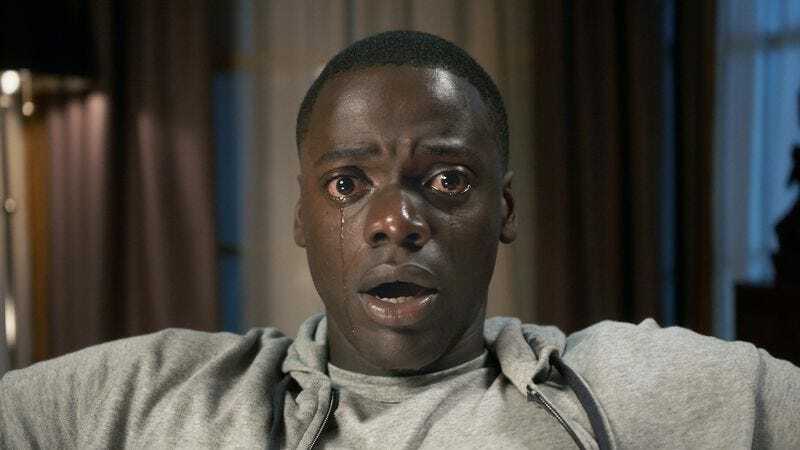 To that end, the supernatural component, once it officially arrives, almost feels like a reprieve, stealing Get Out away from the actual, everyday nightmares it otherwise evokes. Opening at a time when white supremacists have crashed the White House, Peele’s clever, incisive foray into genre cinema makes a point much more frightening than any jump scare or torture chamber: Being black in America is often its own horror movie.